Dancing for fitness. Dance exercise workouts. What Can Dance Exercise Do for You? Did you know you can get a great workout right in the comfort of your home, a workout that can burn calories, make you feel stronger, increase your confidence and reduce your stress all at once? This amazing workout doesn't require any expensive equipment or special skills, and you can do it any time of the day or night. It's dancing, a great exercise choice for people of all ages. Dancing is a fun way to work out that still burns a lot of calories and gives you a full-body workout, even though it doesn't feel like any workout you've ever done before. A program of dance exercise can help you burn calories and lose weight, improve your cardiovascular health, even get you walking a little taller. Dance is a weight-bearing exercise, meaning it's great for your bones and may help prevent fractures later in life. Dance isn't just good for your physical health, however. It's also great for your mental health. Dancing can help reduce your stress levels, making it feel like those annoying things that happen every day are a little more bearable. After dancing regularly for a while you'll find yourself sleeping better and feeling less anxious. Your clothes will start fitting better and you'll have more energy. You'll have a better attitude and feel better equipped to meet the challenges of the day. If you have kids, dancing is a great workout for the whole family. Because dancing is fun, neither you nor your kids will get bored with it, and you'll be showing your children that taking care of yourself is important. It is easy to get started dancing for fitness. Using a dance workout video will ensure that you're getting a full workout, but that small investment is all you really need to get started. I like to say that if you start your day with dance, you'll start your day with a smile that will stay with you all day. You'll be surprised at how much better you feel, both physically and emotionally, after you bring a little dance into your life. 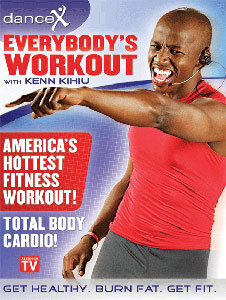 Kenn Kihiu is a fitness expert and the creator of DanceX Fun Dance Exercise Workout DVD�s for both adults and kids.